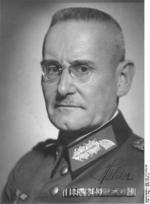 ww2dbaseFranz Halder was born in Würzburg to General Max Halder. He entered service in 1902 and became a lieutenant two years later after completing military academy in Munich, Germany. Between 1906 and 1907 he attended Artillery School and 1911 to 1914 the Bavarian Staff College. During WW1, he was an ordnance officer with the Bavarian 3rd Army Corps. He was later transferred to the 2nd then the 4th Army, holding staff positions. During the inter-war years, he remained in the German military, first serving as a training officer in the 1920s then holding defensive command in East Prussia. In Oct 1934, he became the commander of the 7th Infantry Division in Munich with the rank of major general. In Aug 1936, he was promoted to the rank of lieutenant general and was placed in charge with mobilizing and training the massive German Army that was soon to be unleashed against Germany's immediate neighbors. On 1 Sep 1938, he was appointed the Chief of the General Staff of the Army. In this role, he was one of the officers responsible for the invasion plan against Czechoslovakia, though the plan was never implemented due to Adolf Hitler's political victory in the dismemberment of that country. Wilhelm Keitel noted Halder as "honest, loyal, reliable and obedient." Underneath the apparently loyalty however, Keitel failed to recognize that Halder's loyalty was to Germany and not Hitler. During the Sudetenland crisis in 1938, Halder was one of the leaders in the German Army secretly organizing in the overthrow of Hitler should a war, which he viewed as unwinnable by Germany at this stage, break out; he would fail to launch the revolt in 1938.
ww2dbaseWhen Germany invaded Poland on 1 Sep 1939, Halder was responsible for overseeing the military campaign. In this capacity he had the first-hand knowledge to the atrocities the SS conducted against the Polish, but many criticize that Halder did little to stop them despite not necessarily agreeing with them. Despite his profession as a soldier, Halder was a know pacifist, and on several occasions advised against waging further wars, but the loyal general always heeded to Hitler's orders. He was promoted to the rank of colonel general on 19 Jul 1940. Subsequently, he had a role in the design of invasion plans against France and the Low Countries as well as the plans for the Balkans. In Aug 1940, he began participating in the invasion plan against the Soviet Union, but he knew it was a campaign that would be difficult to win. 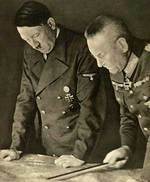 In 1942, he began advising Hitler that Germany was underestimating the numerical strength of the Russians. These disagreements slowly damaged his working relationship with Hitler, finally leading to Hitler forcing Halder's retirement on 24 Sep 1942. After this time, Hitler continued to use Halder as a target of demeaning jokes behind his back. Keitel recalled one incident where Hitler made a joke "at Halder's expense and labeled him a 'little fellow.'" ww2dbaseAfter the failed July Plot to assassinate Hitler, Halder was arrested immediately despite not being a part of the conspiracy. Despite non-involvement, he remained imprisoned due to Hitler's distrust of him. He was first imprisoned at Flossenbürg, then Dachau. On 31 Jan 1945, he was dismissed by Hitler from the army. After being freed on 24 Apr 1945, he surrendered to American troops on 4 May in Austria, and again became a prisoner, this time in American hands. ww2dbaseThroughout his career, Franz Halder kept a diary rich in detail, noting not only the chronology of events but also the observed emotions of the main decision makers in Germany and other trivia that were otherwise not recorded on official documents. After the war, he cooperated with historians in constructing a view of the war through German eyes, acting as an adviser to the US Army Historical Division in the 1950s. US President John Kennedy would later award him the Medal of Freedom for his contributions in history. He passed away in 1972. His memoirs, The Halder Diaries, was published in 1976. "The Russian colossus... has been underestimated by us?. Whenever a dozen divisions are destroyed the Russians replace them with another dozen." 30 Jun 1884 Franz Halder was born. 1 Sep 1938 General Franz Halder was appointed Chief of the General Staff of the German Army (Oberkommando des Heeres), succeeding General Ludwig Beck. He was the first Catholic to be assigned this position. 27 Sep 1938 Franz Halder and other German Army officers set 29 Sep 1938 as the launch date of their revolt should Adolf Hitler lead Germany into a war over the Sudetenland crisis. 28 Sep 1938 Franz Halder went to see German Army chief Walther von Brauchitsch and gained some support for his planned overthrow of Adolf Hitler should there be a war over the Sudetenland crisis. At the end of the day, with Neville Chamberlain visiting Munich, Germany, and thus dramatically lessening the possibility of war between Britain and Germany, Halder called off the revolt. 5 Sep 1939 In a private conversation, Franz Halder and Walther von Brauchitsch both agreed that the war against Poland was effectively won. 25 Sep 1939 Franz Halder noted in his diary that he believed Adolf Hitler was ready to plan a war with France and Britain. 3 Nov 1939 Franz Halder sent a message to Ludwig Beck telling him to be ready to move against Adolf Hitler on or shortly after 5 Nov 1939, which was the date the plans for the invasion of France, was supposed to be made known to top German military leaders. 5 Nov 1939 A plot to arrest or even kill Adolf Hitler, hatched by of his most senior military staff, collapsed. Led by General Franz Halder, the architect of the invasion of Poland, many Generals were appalled by Hitler's plans to continue the conflict by invading Belgium and the Netherlands and feared that the adventure would founder in another Great War quagmire. Walther von Brauchitsch, who met with Hitler and was supposed to be the one to issue the order for his arrest, got cold feet and lost the opportunity to prevent Hitler from plunging Europe into another World War. However one of the conspirators, Colonel Hans Oster of German Military Intelligence, tipped off the Dutch and Belgians about Hitler's invasion intentions. 28 Mar 1941 Before dawn in Berlin, Germany, General Franz Halder completed the German invasion plan for Yugoslavia. 7 Jan 1942 Franz Halder noted that there was a very brief thought of using chemical weapons against Soviet troops, but discussions never went beyond this idea. 28 Feb 1942 Franz Halder noted in his diary that the campaign in the Soviet Union had thus far caused 1,005,636 German casualties, 202,251 of which were killed. He also noted that there were 112,627 cases of frostbite. 25 Feb 1946 Franz Halder was interrogated by US Army attorney Captain Sam Harris; during the interrogation, Halder revealed the plan and the history of the 1938 plot against Adolf Hitler (which was never launched). 2 Apr 1972 Franz Halder passed away. Halder and his surrender to the Allies - It didn't exactly go down like that, nor on the date given. He was not freed on April 24th. And he didn't exactly surrender to the Americans. Halder was one of 139 high-value prisoners Himmler was hoping to trade off somehow. The most likely way was to buy him safe passage, though no one gives that any credit because it was delusional. Nevertheless, the group was assembled (not completely by intent, from what I've gleaned) at Dachau in the last ten days of April 1945. When Dachau was under threat, the group with SS guards left Dachau for the Tyrol (destination Innsbruck/Reichenau) on April 25th, loaded into 3 buses for the overnight trip over the Brenner Pass. Reichenau had not space for them, so they proceeded further south, into the South Tyrol Puster Valley, ending up at Niederdorf/Villabassa, a small village. At a loss what to do, the SS guards failed to watch the prisoners closely enough. General Bogislaw von Bonin got word to the Wehrmacht units at Bozen, who came and ran the SS guards off. This was on or about April 30th. The Wehrmacht general then announced to the prisoners that they were no longer prisoners. The prisoners were then allowed to proceed to a large hotel, the Pragser-Wildsee Hotel, which had not yet opened for the season. The hotel staff, with help from some of the prisoners, put them up as guests for about a week, until the Americans arrived on/about May 5 1945. The entire group was taken first to Verona, then Naples and the isle of Capri. About four weeks later, the German generals and one industrialist in the group were separated out and essentially put under arrest. This would have been around the first week of June 1945. The question will arise: Why were German generals and an industrialist part of trade bait for Himmler? I have not been able to find an answer to that - but it saved Halder's life certainly, being included with the other groups. 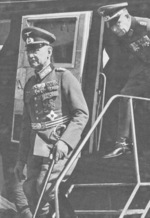 Several individuals (including Abwehr leaders Hans Oster and Admiral Wilhelm Canaris) who had been with the prisoners shortly before Dachau did not make it. They were shot immediately after being separated out, on/about April 8. Halder could easily have been one of those. There is some connection between this group (and possibly others) and the Alpine Redoubt (Alpenfestung), the supposed last ditch defense of the Third Reich in the mountains near Obersalzburg. It is thought by some that that is where Himmler wanted to have them taken. We may never know. The other "high value" prisoners were mostly from other countries - politicians and generals mainly - plus a large number of German family members of the June 20 Attentat conspirators and suspected conspirators. This is an impressive biography of Halder. Outside for the comment I made, I can't see anything else wrong with it. I side with Halder. IMHO, if Hitler had kept his hands out of the war in the east, Halder would have won it. Had Hitler not turned to the oil fields but kept on toward Moscow the Russian war would have been over in early 1942, cold or not. Leningrad was of no great importance. Moscow would have taken out the head and heart of the Soviet war effort. Yes, the Germans should have dressed warmer. But they also should have started earlier in 1941. Late June was 6-8 weeks too late. History turns on such decisions.